Having the perfect fit on your engagement ring is crucial in keeping your ring upright and for avoiding any damage to it. At Lauren B the custom ring order is based on the individual finger’s size it is meant to fit. Whether you are between half, quarter, or eighths of a size, we build bands for every variation necessary. That means that once the band is made to a certain finger size, any adjustment can affect the thickness of the metal and the alignment of the stones set in it. Luckily, for most settings, a mild modification of a half or quarter size is not something to be overly concerned with. However, resizes that are more than one whole ring size can cause issues. This is not the best for the setting's integrity and can result in possible diamond loss and warping down the line. For this reason, we recommend coming to Lauren B in New York or visiting your local jeweler to be properly sized prior to production. It is important to keep in mind that factors such as cold weather can cause an otherwise properly fitted ring to fit looser than what it usually does - time of day, weight gain/loss or bloating, and general climate can all cause variation in your ring's snugness. If you experience this, we often tell people to wear their ring for a while before permanently sizing, just to confirm whether a permanent change in the size is necessary. If you have a large fitting ring, chances are it will spin on your finger because all engagement rings are top heavy. Not only can this cause damage from encountering other objects or by having the metal warp to your finger, it also does not allow for the ring to sit upright. This is an issue you should resolve quickly - either with a standard resizing or the addition of sizing beads or bars. altering the ring and work well for those that have a wider knuckle. The sizing beads will adjust the ring size by about 1/4 of a size. Re-Sizing In this case a jeweler will carefully make a laser incision in the ring and remove a tiny piece of metal before soldering it together. This is a seamless process and there should be no signs of it ever happening. This is a less common scenario since people who do not have the chance to get sized professionally in store will overestimate their ring size. For Lauren B rings, the thinner rounded bands, that are trademarks of our custom engagement ring designs, fit looser on the finger and need to be accounted for. If the ring is too small, we can use the same laser sizing method above and add a tiny piece of metal to the band before soldering it back together. In all cases, after we re-size a ring, we check the band to ensure all the pave stones are perfectly in place, center-stone alignment and for any markings on the band where the sizing occurred. Your engagement ring will likely not fit the same as other rings you might wear every day. Designs with thinner bands need a slightly smaller ring sizing. Thicker options, like many wedding bands, will need a larger size. An engagement ring should have a tight fit in general. There should be resistance when taking it on and off and should not slide right off of the knuckle, or out of place. It should rest towards the base of your finger sitting up right. When you purchase a Lauren B. ring, the first ring sizing is complementary. 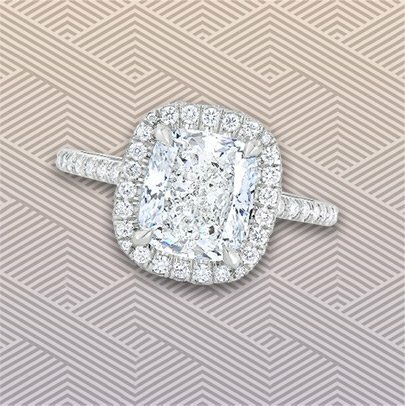 Creating the perfect engagement ring also means getting your future fiancée's exact ring size. It is common practice these days for a couple to come in together to do some preliminary engagement ring shopping together which is an ideal time to record the ring size. At Lauren B, we take detailed notes in your design file, including the ring size, which can be accessed at a later whenever you are ready to move forward. In the event you cannot do the above, here are six ways to find your future fiancée’s ring size while keeping it discrete. Keep in mind these will most likely not be exact but will get you closer to the right number. 1. Asking a close friend or family member can sometimes be the easiest option. If she has a sister, there is a chance they will know she is the same size, or bigger, or smaller. Also, there is a possibility they went ring shopping together and have that information on hand. 2. Take one of her rings- If she wears any type of ring on the engagement ring finger you can use that size to determine. If she wears a ring on the opposite hand, we can also use that as a point of reference to determine the size. Bring the ring to us to measure or to a local jewelry store and have it checked it out in just a matter of minutes. 3. Have a friend or family member take her ring shopping at our store. This way they will be able to casually get her ring size without you being involved in the process and making it look obvious. Have them report back to you with the ring size and keep it in a safe place. 4. Tie a string around her finger- it is not full proof but again will give you a better gauge of the actual size. 5. Have her try on a friend of family member's ring- if it is too big or too small you will still have a good way to determine the size. 6. Show us a picture of her hand and we can give you a rough estimate as to the size. This will help us get in the right ballpark.